The serpent’s teeth to blunt. Antes de volver al pueblo, nuestros héroes deciden volver a inspeccionar los vitreaux para intentar obtener alguna otra pista. Mientras miran los ventanales de la planta baja, Argos recuerda haber leído acerca de los elementos representados en las ventanas como ingredientes habitualmente usados en fórmulas apoteósicas para la transformación en liche. Discutiéndolo con sus compañeros, concluyen que es posible que el trabajo de Vorel con la nigromancia haya estado dedicado a su propia búsqueda de la inmortalidad. Sin más que hacer en la casa, deciden volver a Sandpoint. En el momento en que entran a la sala, Lubruk percibe un intenso olor a pelo quemándose. De repente, los tres ven que la mantícora embalsamada cobra vida, su cara se transforma en la de Cyralie y todo su pelaje se envuelve en llamas. En un movimiento rápido como un relámpago, sacude su cola enviando una decena de púas hacia Argos. Un momento después, la imagen desaparece y la bestia se encuentra en su lugar habitual, como si nada hubiese sucedido. Mientras Lenwë ayuda a Argos a recuperarse de las heridas recibidas, Lubruk se acerca a la enorme criatura embalsamada. El pelaje se encuentra intacto, la piel fría. Pero para asegurarse, la decapita de un hachazo y arroja la cabeza por una ventana. Recuperados de la sorpresa, salen de la casa para emprender el camino. Tan solo para llevarse una nueva sorpresa. En el pozo de agua y en las ruinas de la casa de sirvientes, ven cientos, miles de cuervos que los observan detenidamente. Las aves parecen hallarse enfermas, les faltan plumas, revolotean torpemente, incluso se chocan entre ellas. 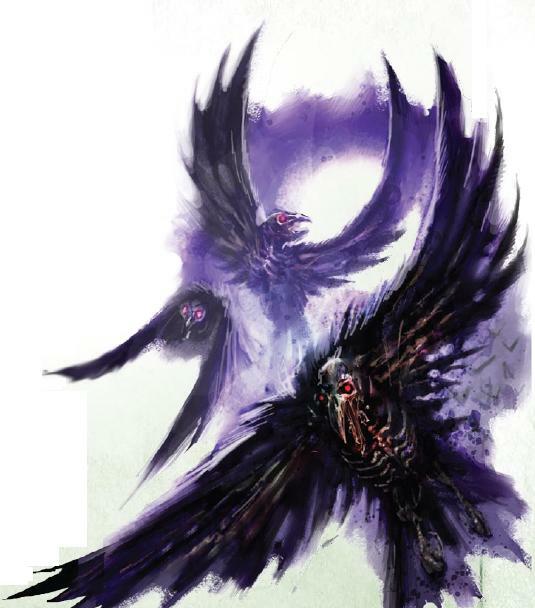 El bardo las reconoce de los extractos de los bestiarios de la Pathfinder Society: llamados carrion storms, son el resultado de aves de rapiña que se han alimentado de cadáveres profanados por no muertos. Usualmente movilizados en bandadas, suelen habitar cementerios o zonas frecuentadas por no muertos. En el momento en que la nube de pájaros se abalanza contra ellos, Lubruk las embate enfurecido, mientras Argos comienza a danzar con su cimitarra y Lenwë arroja flecha tras otra. Minutos después, logran dispersar las aves, y finalmente tienen el camino libre para emprender la retirada. Pero entonces, repentinamente Argos tiene una idea. The Wayward Gull was almost empty at this hour of the morning, but I still felt as if I was the object of a million and one eyes. (The guy seated at the corner of the bar gumming his own wrist had only one eye, hence the odd number.) It was not so-late-it&apos;s-early, but actually early; I awoke early that morning, well before the dawn broke, and I came down to the bar to be alone with my thoughts. And to escape Grünthok&apos;s snoring. I felt a certain camaraderie with the man, though, seeing as we were most often holding the front lines, allowing the spell casters to wave their hands in the air like goons. But I&apos;m not grumbling. Anyhow, maybe he had a deviated septum or something; I&apos;m not judging, I&apos;m just discreetly removing myself from the immediate vicinity. However, I did thank all divinities I could conjure at the moment he didn&apos;t smell like he sounded; those porcine beasts my father and I encountered on one of our infrequent forays to an outlying hamlet in the lowlands were foul. That thought, of course, naturally led me to thoughts of my father. I love my father, because do we ever stop loving, even when those we love are gone? My father was a handsome man, as befits the local lord, but kind, which is not always the case with men in his position. We lived in the manor of a little hamlet called Tyrnen Tarwyll, of course named after our family, for we had been the nobility in the area for many centuries. Ostensibly we "ruled" the town and surrounding areas, but my father taught me and my brothers that no one could rule another person. Those were his words, anyway; in actuality we did rule, because centuries had taught the men in my family that if they swaggered a lot and wore fine clothing they could do almost whatever they pleased. In consequence, although my father was a fair man, our family&apos;s history with the townsfolk was... spotted, at best. For the most part, though, the townsfolk recognized my father as a kind and just lord, so there were few problems (our town had the requisite ruffians that had to be thrown in the gaol from time to time, for instance, but they were fairly harmless). Thoughts of my father unleashed an unwelcome torrent of the past, and I struggled to keep my head above water as memories of my mother, my brothers, and our little province in the mountains threatened to drown my heart in sorrow. This fringed on brooding and even though I had started to scratch a solitary word game in the viscous remains of some spilt beer--the Gull was a cleaner, quieter, and overall nicer establishment than the Dancing Goat, but the trappings of a bar in business (such as the occasional spilt beer) pervaded, as spilt beer is wont to do--I was still drowning in my sorrow. I decided to take a walk through town, to breathe some fresh air, or whatever air there chanced to be; the Gull was stifling to my lungs, my body still--even after five years--longing for the clean mountain breezes of my home. I made my way around jumbled tables and out into the street, which was blessedly quiet at this hour. I&apos;ve always liked being up and about early; the world has a different nature when most of it is asleep. Along with the diminished chance of actually having to talk to anyone, the atmosphere has an almost magical quality, like you&apos;re looking at everything through the turquoise-shaded sensibilities of a dream, and all with soothing distance but the clarity of potential immediacy. I walked past sleepy shops with curtains hiding their wares and other establishments--bakers and butchers, mostly--already bustling with the day&apos;s work. As I turned a corner, I was abruptly confronted with a large glass mirror in a store window, shining with pre-dawn anticipation of the sunlight that would soon flood the street. It startled me, because of its similarity to the woman-high looking-glass that had hung in my dressing room at home. It was shaped in a tall rectangle with gently rounded corners, and the glass was framed with sumptuous maple, carved to resemble filigreed lace, with bright painted accents. The thought skimmed my mind that the mirror in my house had not burned, but had in fact been stolen and was now here, in this shopkeep&apos;s window, but I quickly dismissed this idea. I had picked through the ashes of my raped and ruined childhood home, and I had found the remains of that mirror broken over the body of Namae, the now-ancient woman who had cared first for me, then for my brothers. 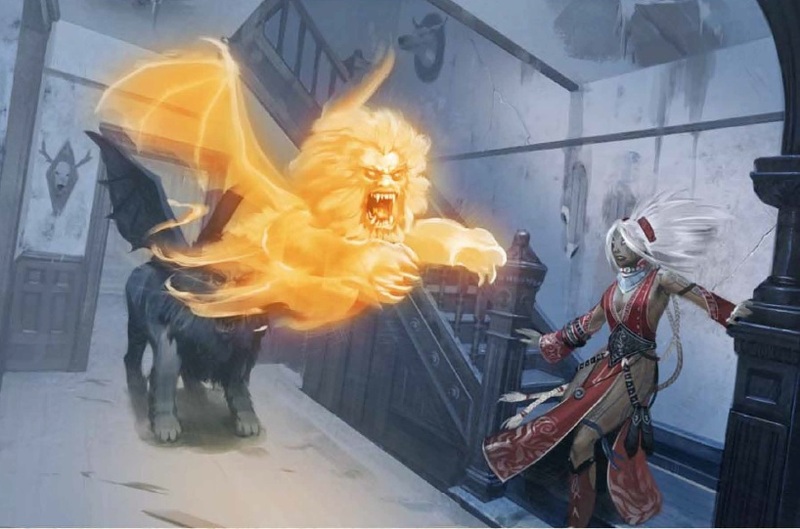 She had been crouched over eight-year-old Duynan and eleven-year-old Gaerun; her last act had been to try to shield my brothers from our attackers. It was unclear who had died first. With a start I shook the memory away, but was caught now by my reflection. If this mirror was the complement of my own, my appearance had changed since last I&apos;d looked into its depths. Where before, as the cherished daughter of nobility, I had kept my hair long, to the middle of my back, I now had it clipped in a shaggy cap that barely passed my earlobes. No longer bright as a raven&apos;s feather, now it more resembled ruffled ebony suede with blood-red highlights in the sun. My face was bonier, thinner than it had been, when I&apos;d known that I&apos;d eat heartily at every meal, and even that I&apos;d eat at all. My skin was still clear, but it was now instead of porcelain it was a pale rosy-brown, and the sun had painted thick freckles on the bridge of my nose and my cheekbones. My lips were still full, but now a deeper russet from days spent in the elements. After the bandits had decimated my town and left me without a scrap of clothing to my name, I had purchased chainmail with the gold my father (always a practical man) had secreted around our estate. I belted it at my waist with a strip of purple brocade I had torn from the edge of a singed tapestry that had hung in the atrium of my house. I wore sturdy leather boots that just brushed the bottoms of my kneecaps, stained almost sable and creased from long wear. Tucked into the boots I wore tight breeches, ostensibly because I could never stand loose breeches, but actually because my mother would never let me go out in such “scandalous” clothing. It occurred to me how sad it was that even when she was gone, I had to oppose my mother, but it was the only way I could think to keep her with me, and that was the real sadness. When I bought the armor I had also bought a long sword and a short sword; I wanted not only to weather blows but to deal some of my own. Soon after purchasing the chainmail, I had bought a little pot of red paint and embellished the left breast of my armor, over my heart, with a simple representation of my family’s crest, a raven above three peaks. My version was just a pair of stylized wings above three triangles, but it sufficed. No one would know what the original had looked like anyway; my family was over. A week later I had opened my palm and traced the lines over in my own blood. My only ties to the past were my blood on my family crest and my pale, almost spectral green-grey eyes, a striking feature shared by most of the members of my mother’s family. I waved away the tattered shrouds of history and made my way back to the Gull, slipping through the waking streets. I tried again to loose the chains of memory shackling my bones, but as for the past half decade, they were solid against my struggles. Skaeya suddenly looked up from her mug straight into Asquith’s eyes. Then, just as quickly, her gaze darted to a window, to Eleanor sweeping up around the abandoned tables, back to her ale. And after a fortifying quaff from her flagon, Skaeya went on with her story. So, then, my parents wondered, why had an envoy from the Throne itself come to relay this news to them? They were told that they could not be told. Well, not precisely; the envoy had orders to bring them back to the throne, and with all their earthly possessions. There, the already exhausted horseman reasoned, all would be told. My mother, being an empathetic human being, invited the man in for something to eat and drink, and he gladly obliged. There was no room in the small cabin for him, but could he sleep in the barn? So, that night, with an envoy from the Throne in the hay loft of their ancient barn, my mother and father gathered saddlebags of clothing and blankets, a few cooking pots and utensils, and food and waterskins, in preparation for a journey to the Capitol Estate. The messenger had made it seem like they would not be coming back, so they took everything the horses could conceivably carry. Their only concession to sentimentality was a few of Kaalya’s sketchbooks and some carvings of Daeyu—miniature animals, trees, and people—nestled in handfuls of green hay. The books and carvings were stuffed in a knapsack that my mother would carry on her back. The next morning, they loaded the two sturdy draft horses, Fritte and Taigh, with the bags. The two great deerhounds, Stilla and Garrei stood calm and composed; they were trained to do so, but even so it was unlike the normally indomitable troublemakers. It was almost as if they knew they were saying goodbye to their home. Daeyu boosted Kaalya up to the coarse wooden saddle with Tsavi wedged between her body and Fritte’s neck, and he swung up on Taigh’s back holding Niveane in front of him, and they set out to the Capitol with the envoy on his lanky messengers’-mount—this morning still looking a bit lathered—in the lead, and the hounds ranging ahead. The return trip to the Capitol was considerably slower than the envoy’s journey out to my parents’ farm, and after a while on the road with his horse stepping out regally he succumbed to the warm sunshine and struck up a conversation with Daeyu. When my father several times had made an effort to bring my mother into the conversation, the envoy good-naturedly sought her opinion on many subjects, from farming to cooking to the best way to wash out wine stains. When he learned that she spent her days in the forest hunting while my father was at work in the fields, he engaged her in a long discussion of the best way to field-dress a deer and stalk autumn pheasant and goose. Stilla and Garrei seemed confused at first that Kalya wasn’t shooting at the birds they flushed from the brassy grasses of the late-summer fields (because, of course, she couldn’t shoot while holding Tsavi mounted in front of her), and eventually they began to take turns trotting next to her when they tired of chasing pheasant, being sure to stay safely away from Fritte’s pendulous hooves. The messenger was happily conversant on the mundane; the three talked about the weather, hunting, farming, horses and livestock, cooking, herbalism, even the shape of the clouds in the sky. The messenger even told them a little about himself, that he was a ward of the castle and had come to the Capitol Estate when he was a young boy to learn to serve the Throne in whatever capacity was required. In this mindset, he had learned something of military and survival arts—how to ride, how to handle various arms, and to how to survive from the land—as well as of other, more delicate arts—scribery and painting, mathematics and philosophy, and cooking—including everything in between. The man could count only some thirty years as his life, but he could boast a great many skills. The old King had treated him well. On his new masters and mistresses, the envoy would not converse. He stubbornly refused to tell Daeyu and Kaalya anything about the princes and princesses, the old King’s children. He also was obstinate about the reason for their summons. After a solid twenty minutes with no progress in that direction, my parents gave up the direct approach, but continued discreetly slip a question in about the royal succession, to no avail. It seemed that the messenger was true to his oath of secrecy, which he did deign to mention. To whom was this oath made, my mother asked. “Them” was the only answer the man would give. Again Skaeya stopped speaking, but this time she stared at her empty mug, then looked almost pleadingly at Eleanor, who had finished sweeping the floor and was in the process of extinguishing the candles in the sconces set along the walls. Eleanor at first gave Skaeya a stern look, but soon relented. Asquith shot Eleanor a grateful glance as he removed his sore spine to an overstuffed armchair in front of the still-roaring fire. Skaeya grumbled a bit as she gave up her mug but came to sit in a chair across from Asquith. As she gathered her jumbled thoughts to speak again, Asquith thought he could see the pain in her eyes melting away in the firelight as she unburdened herself of her past.